Our amazing brain has the consistence of jelly and weighs around 1.4 kg in adults. III. Grey matter (cerebral cortex). The brain is located inside the skull and is well protected against external influences. The brain has the consistence of jelly and weighs around 1.4 kg in adults. The brain consists of neurons, nerve fibres, also known as axons, and support cells. These are arranged in a very special way so that they can best perform their function. The nerve cells are located in what is called the gray matter placed predominantly in the folds (gyri) of the outer part of the brain called the cerebral cortex. There is also gray matter deep in central structures of the brain. Neurons with similar functions are located in the same area. Each nerve cell can have hundreds of thousands nerve fibres (axons) for communicating with other neurons. The areas containing the nerve fibres, called the white matter, are located centrally deep in the brain. V. Sensory center (sensory transmissions from the body). muscle coordination). VIII. Spinal cord. This is the largest and outermost part of the brain and this is the site of all the higher consciousness and intelligence functions. 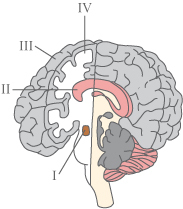 The forward part is the frontal lope containing the nerves connected with our personality, concentration, planning and problem solving. Also located here is a collection of neurons that are involved in our ability to speak, the so-called Brocas speech center. Right at the back of the brain is visual cortex where vision sensory input is processed. On the side of the brain is the temporal lope which controls hearing, memory and also a region involved in the interpretation of sensory input. In the center of the cerebrum lies the middle brain – the diencephalon - containing many important areas of the brain. The visual pathways cross each other here. Thalamus: This is a walnut sized mass of nerve tissue located at the top of the brain stem connected to all parts of the brain which functions as a sort of distribution center for sensory impressions from the rest of the body (except smell). All sensory information flowing to the brain run through here, and some will be modified along the way as the thalamus functions as a filter passing only information of particular importance. Hypothalamus: This cherry sized region of the brain, located just below the thalamus, controls the sympathetic nervous system (part of the automatic nervous system) and ensures that the body can maintain a stable internal environment. Hypothalamus controls such things as body temperature, heartbeat, blood pressure, salt & fluid balance, hunger and also different glands production of hormones and sleep rhythm. Pituitary: This tiny pea sized gland attached to the hypothalamus on a small stalk of nerve fibres is the most important gland producing a wide range of hormones released directly into the blood stream. It is often referred to as the master gland. The brainstem is an extension of the middle brain and is a link between the brain and body (the spinal cord). 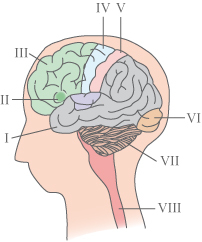 The brainstem contains the nerve fibres responsible for the communicating between the brain and the rest of the body. In addition, there are some very important centers here. Among others the nerve tissue of all the nerve cells which control the muscles and senses from the neck and up. Here is also the breathing center, a center controlling the hart beat and another center controlling arteries and muscles. Spread throughout the brainstem is the special center responsible for our awakened state and our response to different stimuli. The cerebellum is located at the back of the skull just below the cerebrum behind the brainstem. Like the cerebrum it consists of gray and white matter with the gray matter as the outer layer. The cerebellum processes the sensory impulses connected with the physically position of the body and the limbs. This allows us to keep the balance and coordinate movements. Many of our acquired motor skills such as walking or cycling are coordinated from here. brain arterie. V. Spinal cord extension. Inside the center of the brain are fluid-filled cavities which communicate with each other. 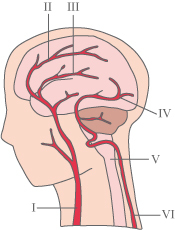 These are called the ventricles of which there are four and here the cerebrospinal fluid is produced which completely encloses the brain and spinal cord. The function of the cerebrospinal fluid is to protect the brain from shocks but also to provide the right environment for the brain. For example waste substances from the brain are released into the bloodstream via the cerebrospinal fluid. Normally, there is a fine balance between the volume of produced cerebrospinal fluid and how much which is drained away. If this fine balance is compromised an excessive accumulation of cerebrospinal fluid might follow leading to increased pressure inside the skull. The condition is called hydrocephalus and can be a very serious condition. The brain cells are very sensitive to chemical exposure and are protected by the blood-brain barrier which ensures that harmful substances in the blood cannot pass to the brain cells. This barrier is created through an extraordinary density of the blood vessels which lead blood to the brain. As a result only substances formed of very small molecules, soluble in fat, can pass through the vessel walls. Therefore certain drugs are ineffective for brain application as they cannot permeate the blood-brain-barrier.